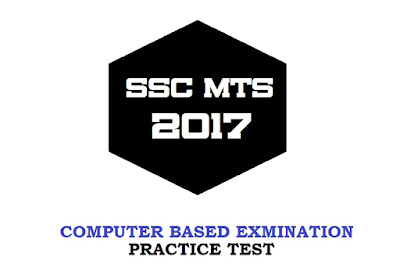 SSC has released finally released the dates for SSC MTS 2017 Re-examination two days ago. SSC had cancelled their previously conducted exams as some sources leaked the question papers through social media. The re-examinations are to be held from September 16, 2017, to the date October 26, 2017. The examination will be conducted in online mode. The re-examination is made online to avoid leakage like the previous time. It is for the first time an SSC MTS examination is being conducted online. To practice, SSC has made a provision to the candidates for taking the model practice test on its official website. The candidates can try practice tests by logging into the official website of Staff Selection Commission. Through the practice test, Staff Selection Commission is giving the candidates an opportunity to be familiar with the new mode of examination. Step 2: In the site, you can see a link with a text: 'Practice Text for Computer Based Examination for Multi-tasking Staff(NT), 2016'. Click on the Link. Step 3: You will be directed to a new page, where you can see a 'Start the Examination' button. Now click on it. Step 4: From the newly appeared page, the candidate will be asked 'Registration number' and 'Date of Birth.' Key in your roll number and date of birth in the required columns. Step 5: Push 'Submit' button to take the test. Take as much as practice tests you can, so that you can avoid confusion, fear, and tension while attending your real online exam. The admit cards are expected to be available for download from the first week of September 2017. Here is how you can take the practice test for the examination before the examination.